Games: 138 approx, plus approx 28 non VFA games. Billy Strickland played for Carlton in the VFA between 1885 and 1892, including our Premiership year of 1887. Shortly thereafter he joined Collingwood (he stood down from the last game for Carlton in the 1892 season against Collingwood (which was also Collingwood's first victory against Carlton) and from 1892 he was at Collingwood, including being their first Captain in the VFL (1897). This was his last year of playing football. 1885 Billy Strickland a new recruit from Brunswick. 1886 Began to develop his prowess, he was a towering force in the early games. 1887 "The Australasian" named him as one of the stars of Carlton as a wing and was one of the stand out players for Carlton against South Melbourne at the M.C.G. on June 25 1887. 1887 C.F.C. Annual Report Strickland scored 1 goal during the season. 1888 Gave the Blues splendid service. 1890 Captain and one of Carlton's best. 1891 Helped lift the Blues to second position. Billy Strickland was named in the 24 man squad to play against Collingwood at Victoria Park, as mentioned above, he stood down for this match. This seems odd as he was elected to the Carlton Committee the following March. See March 29 1893 below. 1892 Among Carlton's best players. 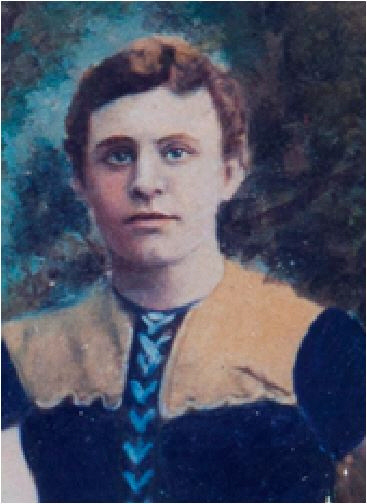 Strickland appears in the 1887,1888,and 1891 Carlton Football Club team photos. _* Elected to the Carlton committee at the AGM. W. Strickland a few weeks later would walk out on the club and go to Collingwood. 1893 Had been a Carlton champion and at Collingwood he rose to the same heights, and led Collingwood to their first ever V.F.A. flag in 1896. Tranferred to Collingwood on the eve of the 1893 season along with H. Simpson and George Williams . 1893 Click below to read The Argus report of the V.F.A. Permit Committee proceedings about Strickland's transfer application. Also an insight into the Blues leadership and on field problems. From The Argus May 4 1893. The Clipper (Hobart) p2 said; "Did you receive 200 pounds over the match played the season before last? was a query put to Strickland of Carlton." 1893 Strickland and Simpson debuted in the May 27th. clash Collingwood vs Essendon. Captained a VFA combined team in a charity match against the 1894 premiers Essendon, at Victoria Park. "Old members of the Carlton club present must have realised what a stupendous mistake they made when the team took sides some years ago on the question of captaincy, and rejected Strickland in favour of another man, who, though a fine player, never once showed the least talent for leadership." "To Strickland, a shining light of the old and illustrious Carlton team, much of the credit for Collingwood's victory is due. As captain, he has, during the season proved himself as 'cute as he his effective and ubiquitous, and his generalship on Saturday made the grandest coupe of all." 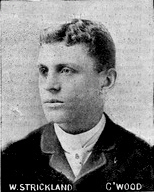 Strickland was Collingwoood's first Coach (1904). Relation of T. Strickland? Not a brother, maybe a cousin. 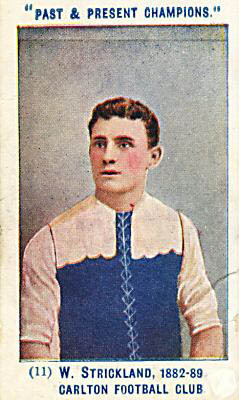 In 1900 , Strickland's nephew, also named Bill, played a single game for Carlton. "The name of W. Strickland, the old Carlton and Collingwood player, appears amongst the members enrolled in the Balmain District Club. As a player Strickland is very well known, but it is perhaps, as a football legislator that he is best known. He has represented Victoria on the Australasian Council, and holds a record as manager of past Victorian interstate teams. His experience should prove beneficial not only to the Balmain club, but to the game in general in New South Wales." Arguably best remembered as Collingwood's first ever premiership captain, Billy Strickland had already been playing football for more than a decade when he joined the Woods in 1893. After beginning with Brunswick in that club's pre-VFA days, he joined Carlton in 1885, and in eight seasons with the club proved himself one of the most prodigiously talented centreline players in the game. He was also an extremely disciplined and determined individual, and by introducing these qualities to Collingwood he was heavily instrumental in transforming a makeweight combination into the best in the colony. Strickland was ostensibly the team's centreman when it beat South Melbourne to secure the 1896 VFA premiership, but he played more like a follower, roaming far and wide in search of kicks, as well as coordinating his team's activities at first hand. His inspirational, energetic performance, together with some astute tactical decisions, were important factors in Collingwood's eventual narrow win. "Collingwood owes much to Carlton, for it's first captain was W. Strickland, who had made his name with the Blues. The influence of Billy Strickland, one of the finest sportsmen who ever played the game, is still felt at Victoria Park. He established the side on strong, vigorous lines, and year after year teams wearing the black and white livery have endeavoured to live up to the traditions then set." Contributors to this page: blueycarlton , pblue , molsey and Jarusa . Page last modified on Wednesday 07 of December, 2016 22:39:18 AEDT by blueycarlton. 1987 Rd 8 - Shane Robertson & David Glascott looking for the loose ball.